There have been many great advances in the features and styles of refrigerators throughout the years. When the first refrigerators hit the market, people were far less picky. They just loved the chance to keep food fresh and safe in their own homes without having to lug about large blocks of ice. The introduction of the fridge was a great invention. However, over the years, people have demanded more. The typical style with the freezer on top and fridge on the bottom wasn't cutting it, so manufacturers came up with multiple alternative forms that people jumped all over. Then people demanded more organization options and different features that would make the fridge easier to use. Manufacturers met those demands with an array of great features. What this all means for you now is that if you are buying a new fridge, the choices and options are kind of overwhelming. Narrowing things down to choose the best fridge can be tough. That is why we want to help by providing this full review of the Samsung RF32FMQDBSR. Our review will look at all the details, starting with some insight into the brand. We will go over the specification for this model, along with pricing and pros and cons. We also will compare the RF32FMQDBSR to three similarly priced refrigerators from other top brands to see how it stands up. Samsung is a well-known name. It has been a leader in electronics for a long time. The brand is probably best known for its smartphones and televisions, but it offers a large range of products, including refrigerators. Due to its background, Samsung is able to nicely combine technology with refrigeration to produce unique products that are cutting-edge. Samsung was founded in 1938. At that time, it was a training company. However, a little over 30 years later, in 1969, the company started getting into electronics manufacturing. It introduced its first television that year, and the rest is history. The refrigerator line from Samsung is known for its overall value and high quality. Consumers can expect reliable products that keep food fresher longer, along with innovation and style. Most Samsung refrigerators go above and beyond expectations with unique features that help make life easier for those that use them. Samsung introduced its first fridge in 1974. It was a forerunner in energy-efficient products. It also was one of the first to introduce the door-in-door feature, WiFi-enabled technology and the convertible fridge to freezer zone concept. 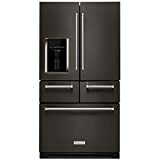 The Samsung RF32FMQDBSR is a French door style refrigerator, but it has four doors total. There are two doors on top and two on the bottom with one of the bottom sections having Cool Select technology. This provides the option to use this section as a fridge, freezer or something in between. This feature gives you more options and more ability to customize. This high-end model has many different features designed to make your life easier and to allow you to get more function out of your fridge. The RF32FMQDBSR has a total of 30.43 cubic feet of storage space spread out between the fridge compartments, the dedicated freezer and the Flexzone Cool Select section. The refrigerator's complete dimensions are as follows: 35 3/4 inches x 72 7/8 inches x 35 3/4 inches. The unit is powered by a Triple Cooling system with surround air flow. It also has Power Freeze and Power Cool options, which allow you to quickly get the temperatures back to normal after adding food items or having the doors open for an extended time, such as when you are unloading groceries after shopping. This helps to maintain the temperatures all the time without major fluctuations. The fridge also features an external ice and water dispenser. You can choose either crushed or cubed ice. It has LED lighting for brightness and easy use. The fridge also features a control panel with ice blue display lighting. It has contoured doors with the CoolTight technology. It also has a door alarm that will sound if doors are open for longer than two minutes. The organization features also include a total of six bins. Two of those are gallon-sized bins. The FlexZone area, which has the Cool Select feature to adjust the temperature between fridge and freezer, has a total of 6.165 cubic feet of space. It has four temperature zones and LED lighting. Organization features include one shelf and two drawers. The freezer offers 12.33 cubic feet of space with LED lighting so you can easily see what is inside. It has one shelf and three total bins. As far as the warranty goes, you get some nice coverage from Samsung. The warranty covers parts and labor for the whole unit for one year. In addition, the sealed system has a five-year warranty, including parts and labor. The compressor has a ten-year warranty on parts and a five-year warranty on labor. The RF32FMQDBSR from Samsung is a 2015 model, so it has some age on it. The fact that Samsung has discontinued it should not be too surprising since Samsung releases new models regularly to replace older models. You cannot buy this from Samsung directly anymore, but when first released, the manufacturer's suggested retail price was $3,999. At the time, this was a price on the higher end of what Samsung had to offer. It used to be sold by pretty much any retailer that carried Samsung refrigerators, but it is kind of difficult to find it now for sale in new condition. You can find it at Sears Outlet for $2,099.93. Do note that this outlet store often sells appliances that have some minor cosmetic issues or ones that served as saleroom floor models, so while they may be new, they may not be in perfect shape. Walmart also has a very limited supply of the RF32FMQDBSR for $3,122.30. Another option if you really want this model is to look for used options. It may not be easier to find them this way now, but in a couple of years, it may be easier since that would be more likely when people would look to upgrade if they bought this new. In the meantime, outlets and retailers that focus on selling discontinued appliances are probably going to be the best and easiest places to find this fridge. Comparison shopping is the idea of finding products that are similar to what you are buying to see how they compare to the product you are considering. Doing this, though, can take some time because you have to look over information for each product. To help you save time, we have gone ahead and done the work for you. Below, we compare the Samsung RF32FMQDBSR with three similar refrigerators from three other manufacturers. All of these are similarly priced and generally the same in design, but we do note any differences. The RF32FMQDBSR is a high-end refrigerator, so it offers a lot of great features. The FlexZone is really nice because it gives you more storage options. It also has a roomy design to allow you to use it more easily. However, it is missing some basic features, such as humidity-controlled drawers and a dairy compartment. Many people think it looks high end, but the features are lacking. Overall, though, it does function well and is nicely built. This fridge doesn't really measure up to the Samsung in that it lacks any real extra features. It is a fairly basic French door fridge. However, what it lacks in flashy features, it makes up for with a great design inside and out with a lot of space. The configuration of some of the organizational functions, though, is lacking. Also, there are some quality issues that seem to plague this unit with cooling and the icemaker. It is always smart to look at the pros and cons of a refrigerator before buying it. The best way to learn about what is good or bad about a product is to read the reviews from people who own the product. They have the experience and inside knowledge and are usually willing to lay the truth out there no matter how bad it may be. They also like to talk up the things they love. However, user reviews can be very biased. Some people make statements based on one experience or an initial reaction. Someone may have had a bad delivery experience and took that out in the review on the product. Others may feel bad about saying anything negative, so they are too positive. We went through countless reviews to get to the heart of things. We weeded out the bias to provide you with the following accurate pros and cons list. We give the Samsung RF32FMQDBSR a four out of five stars because of a few key issues. We feel like this is a fridge that is trying to be high-end, but it fails in the basics. It looks great and has some really nice features, such as the FlexZone space and four-door design, but it is missing basic features, such as a dairy compartment and humidity-controlled drawers. In addition, Samsung failed with the icemaker on this unit. Too many reviewers left comments about the expense they racked up trying to get this fixed and keep it running. It seems to be a defect that is not recognized by Samsung. Overall, we do think this is a decent buy and good value. Since it is discontinued, though, it won't be easy to find. With that in mind, we would suggest looking at a different Samsung model. Perhaps the company has fixed the icemaker issue and added back the basic features in more recent models, which would make them a much better value overall. Overall, we do think this is a decent buy and good value. Since it is discontinued, though, it won't be easy to find. With that in mind, we would suggest looking at a different Samsung model.